Surprise, simple, straight to the point. 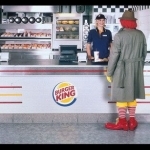 Another classic campaign from Burger King. Like their snacks, consistently better quality than big Mac. The same applies to this campaign: here.